During the extended space travel missions we're aiming for in the future, astronauts won’t always be able to rely on the cargo they take with them. Each additional pound equates to more fuel, and more fuel means more money spent on what are sure to be costly deep-space missions. One way around this is to use materials that can be found on surfaces beyond the Earth—which is exactly what the “asteroid mining” company Planetary Resources has built their business around. The company hasn’t yet had the chance to demonstrate this concept in space, but they have found a way to create a scaled-down example here on Earth. 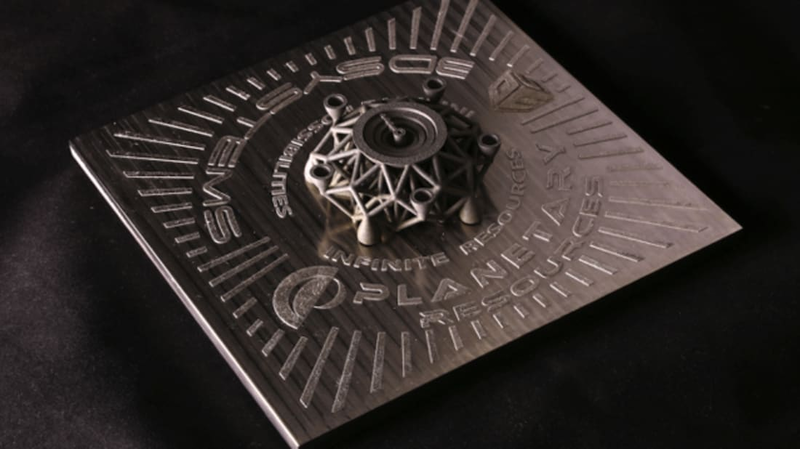 At this year’s CES, Planetary Resources debuted the first-ever object 3D-printed from extraterrestrial metal: a part of a spacecraft modeled after the company's Arkyd craft. To build it, they took a meteorite fragment that landed in Argentina more than 4000 years ago and processed its materials through a 3D Systems ProX DMP 320 direct metal printer. According to the Planetary Resources team, the space rock consisted of iron, nickel, and cobalt, making it similar in composition to refinery-grade steel and the perfect base for their project. In order to transform the solid meteorite into printable material, the team used plasma jets to melt and atomize the object into a cloud of metallic power. The substance was then extracted through a vacuum system. "It condenses like rain out of a cloud,” the company’s CEO Chris Lewicki told Engadget, "but instead of raining water you're raining titanium pellets out of an iron nickel cloud.” From there, the printer was ready to layer the material into whatever shape it had been programmed to. While the project was successful on Earth, serious adjustments would still need to be made before it’s ready for use in space. One obvious concern is the lack of gravity, which is currently essential to keeping materials in place while they're being printed. The next project on the horizon for Planetary Resources is an "infared Earth imager" satellite that will supposedly scan for resources here at home.